Safina is founding president of The Safina Center at Stony Brook University, where he also co-chairs the university’s Alan Alda Center for Communicating Science. Winner of the 2012 Orion Award and a MacArthur Prize, his work has been featured in National Geographic, The New York Times, CNN.com, The Huffington Post and Times Beacon Record Newspapers. On Aug. 6, Safina will speak about and sign copies of his latest nonfiction landmark book, “Beyond Words: What Animals Think and Feel,” sharing some astonishing new discoveries about the similarities between humans and animals. There will also be a Q-and-A. Don’t miss this special event. For more information, please call 631-632-3763 or visit www.carlsafina.org. An aggressive crocodile was found in an open cardboard box in a Melville parking lot and handed over to officials at the Suffolk County Society for the Prevention of Cruelty to Animals on Tuesday, officials said. The three-foot-long croc, discovered at 25 Melville Park Rd., was “very aggressive and its mouth had to be taped shut,” according to a statement from the Society for the Prevention of Cruelty to Animals. Chief Roy Gross said that Jerry Mosca, the director of the Huntington Town Animal Shelter, and another animal control officer, responded to an anonymous call about the crocodile. Mosca didn’t immediately return a call seeking comment on Tuesday afternoon. The New York State Department of Environmental Conservation Police and Suffolk County SPCA investigators will team up to get to the bottom of who left the crocodile in the parking lot, according to the statement. Anyone with information is asked to contact the Suffolk County SPCA at (631) 382-7722. All calls will be kept confidential. The sun appeared just in time for Suffolk County Legislator Kara Hahn’s (D-Setauket) ribbon cutting ceremony that marked the official opening of Forsythe Meadow County Park/Nora Bredes Preserve’s walking trail. The ceremony took place Monday afternoon at 52 Hollow Rd. in Stony Brook. More than 50 people were in attendance including Hahn; former legislator Vivian Viloria-Fisher; Cynthia Barnes, president of the Board of Trustees Three Village; and Louise Harrison. Barnes and Harrison were both co-chairs of the Coalition for the Future of Stony Brook Village. Once Hahn cut the ribbon, those who attended the ceremony were invited to hike the trail. Coalition members wore pink ribbons, which the group selected upon their outrage that developers wanted to turn the property into a 40-house subdivision. For these members, the trail is a symbol of success in an effort to preserve this approximate 36-acre property. But according to Jeffrey Weissman, scoutmaster of Troop 377 for the Three Village Boy Scouts, the trail will not be the last improvement made to the property. Weissman wants to have more benches in the area among other improvements. The first net-zero energy use store in New York opened in Miller Place on Friday. Brinkmann True Value Hardware is the first building in the state to earn the net-zero status, according to PSEG Long Island. This means the total amount of annual energy used is approximately equal to the amount of renewable energy created on the property. Local elected officials, members of PSEG Long Island and Green Logic Energy, a renewable energy design and installation company, attended the grand opening. “We were always interested in solar power, but when we met Al, it grew into something bigger. Net-zero energy got in our head, as soon as we heard of the idea we fell in love with it,” co-owner Ben Brinkmann said. Al, or Albert Harsch, renewable energy consultant for Green Logic Energy, was very excited to see the idea come to fruition. Green Logic Energy was contracted by the Brinkmann family to design and enhance the different technologies needed to effectively and efficiently create a net-zero result. During the planning and construction phase, the family also worked with PSEG through the utility’s Commercial Efficiency Program, which offers resources as well as rebates to customers who install energy efficient equipment. The Brinkmann family was surprised to find out that they were the first net-zero building not only in their industry, but also the first retail facility in the state. Energy efficiency measures for the store include solar panels, geothermal heating and air conditioning, LED lighting and equipment, and a thermoplastic cool roof. The cool roof is able to reflect sunlight and heat away from a building, which reduces the roof temperature. By employing energy efficient measures, store will save 64,000-kilowatt hours of energy per year, for savings of roughly $11,000 annually. According to PSEG, the initiative is equivalent to removing 27 cars from the road or 14,804 gallons of gas not consumed, annually. “These small businesses continue to invest in the community, and we’re seeing a resurgence of these kind of establishments, our residents want a personal touch when they shop,” Brookhaven Highway Superintendent Dan Losquadro (R) said. Losquadro said he hopes the store will serve as an inspiration and model for the town. The Brinkmann family is in no way done with their efforts. “We have more expansion planned, it’s our goal by 2025 to be net-zero company-wide,” Brinkmann said. By now, most gardeners know two restraints on Suffolk gardens. Fertilizer cannot be used on lawns before April 1. It must be stopped by Nov. 1. This is to prevent excess fertilizer, which can’t be taken up by plants in the cold weather, from being washed into and polluting the water table and surrounding bodies of water. The second rule has to do with what plants can no longer be propagated and sold in the county. This is to prevent invasive species from taking over and forcing out native plants. The Do Not Sell list details these plants. Here are some that you may be familiar with or considering planting. Remember, these plants are not illegal to plant and grow, but do you really want to? They’re on the Management list for a reason. English ivy (Hedera helix) is one that really takes over. Many years ago, when I didn’t know any better, I planted a few small plants. To this day, I’m still pulling out ivy plants. They spread like crazy, love Long Island’s climate and soil, and really take over. If I knew then what I know now, I’d never have planted them. Katsura tree (Cercidiphyllum japonicum) is a native of Japan and China. It’s grown as an ornamental tree here. A gardening friend of mine planted several and was told that the tree was relatively slow growing. She was very surprised at how quickly they grew and how large they got. It’s hardy in zones four to nine. It does well in acidic soil. The leaves turn a beautiful red color in autumn, but its aggressive nature makes it a problem. Asian wisteria (Chinese and Japanese) is absolutely gorgeous, but does take over. Personally, I think it should be on the Do Not Sell list, but that’s just my opinion. Unless you are prepared to control it by pruning and pulling up any volunteers, avoid this one. It does extremely well in Long Island’s climate and soil, needing little in the way of fertilizers. The vines reach for the sun, so you will sometimes see them blooming at the top of trees to which they’ve become entwined. If you must grow these wisteria, train them around a pergola or gazebo and keep the pruning shears handy. Periwinkle (Vinca minor) has blue flowers and is sold as a ground cover because it spreads so easily. Consider this when deciding to plant — it does spread easily. Callery pear (Pyrus calleryana or Bradford Pear) is a beautiful tree, which is why it has become so popular, with beautiful white flowers and intense burgundy leaves in fall. It’s relatively quick growing and is the one of the last trees to lose its leaves in fall. In addition, it is disease resistant. All in all a great tree? Well, yes and no. It’s known as a tree whose wood splits easily and it’s not structurally sound — definitely not a good quality. Some produce viable seeds, so they can spread quickly. Other common plants on the Management list include Common or European barberry, Russian olive, Morning glory, California privet, European privet, White mulberry and Kentucky bluegrass. Cornell Cooperative Extension of Suffolk’s website has a complete list of plants on the Management list; visit www.ccesuffolk.org. Asharoken Village residents will soon have to decide if they want support a U.S. Army Corps of Engineers-backed proposal to replenish the community’s eroding beaches. The $30 million idea involves building the beach back up with more sand to fight erosion. The issue concerning many residents is that in order for the plan to go into effect, public access must be granted to private properties that have new sand put down on their beaches. Currently, the public is only afforded access of a private beach property below the water line. However, if the village board approves this proposal, the public would have access above the mean high water line to certain private properties. Some trustees on the village board have said they will not approve a plan that residents don’t agree with. According to Village Trustee Mel Ettinger, five public access points need to be established for this pitch to go through. He said currently the public can access private beaches from two different areas, and are not trespassing as long as they are below the mean high water line. Since the Army Corps of Engineers is largely funding the project, public access is a must in order for the proposal to go through. The Army Corps would pay for 89.5 percent of the $30 million costs to help fight beach erosion, and the village would have to pay 10.5 percent, or about $3 million dollars. “The board of trustees and the mayor are doing our due diligence in exploring the issues associated with putting sand on the beaches and making sure residents are being heard,” Ettinger said in a recent phone interview. At the end of June, the Army Corps presented the board with five different versions of the proposal, all varying in costs and methods. On June 30, the Army Corps met with the village board and recommended a plan that consists of a berm and a dune system with groins on the northwestern end of the project area. This area includes the properties on the side of Asharoken Avenue that touches the Long Island Sound. Berms are wedges of sand that face the sea. They are composed of sand from offshore, and help indicate that the beach has been gaining sand in recent weeks or months. Dunes are hills of sand that have either accumulated over time or have been bulldozed in. Artificial dunes help to hold an eroding shoreline in place. “Groins in combination with new sand would reduce the erosional effect of existing groins and reduce the frequency of re-nourishments needed,” James D’Ambrosio, public affairs spokesperson for the Army Corps of Engineers said. According to D’Ambrosio, if the residents of Asharoken do not approve this idea, then the Hurricane Sandy funds that were allocated this project would be used elsewhere. Ettinger said once the board decides on a plan, it is required to write a letter to the Army Corps requesting which plan they want to go ahead with. Then, assuming the Army Corps approves the decision, the board will prepare a presentation to the village residents that explain all aspects of what it would mean to move forward with the plan. “The best decision is to come up with a plan that the residents are in agreement with,” Mayor Greg Letica said in a recent phone interview. Letica also mentioned that there are other options to ensure the safety and longevity of the beaches in Asharoken while still maintaining private access. If residents themselves entirely footed the bill, then there would be no need for the Army Corps financial assistance, and thus no obligation to make private beaches public. With the summer in full bloom, the Friends of the Greenway will mow, prune, clip and beautify the Greenway Trail — and the group would like community help. Volunteers for the event, this Saturday, July 25, from 8 to 10 a.m., should bring gloves, trash bags, clippers, mowers, brooms or shovels along with any gardening tools. They can choose an area on the hiking and biking trail to clean or report to a trailhead for an assigned task. The Greenway Trail, which opened in 2009, runs from Limroy Lane in East Setauket to the New York State Department of Transportation parking lot in Port Jefferson Station, close to Route 112. A monthly effort to clean the trail will help maintain the community connection. Volunteers who cannot make the Greenway’s monthly beautification schedule can contact Charlie McAteer from Friends of the Greenway at cfmcateer@gmail.com to find out other ways to help. 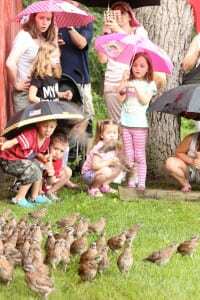 A record number of bobwhite quails were released this year, and many of the students, teachers and parents who raised the birds helped welcome them to Caleb Smith State Park Preserve in Smithtown on Saturday. For 12 years, Eric Powers, a biologist and wildlife educator, has been at the forefront of organizing the annual quail release at Caleb Smith and other parks in the area. He described this year’s event as the largest one yet, as a record number of schools raised the quail chicks and 1,400 quails were released. “The idea of bringing back the quail is to bring balance back to our ecosystem,” Powers said at the rainy morning release. Unlike nonnative guinea fowl, which “eat good wildlife” like salamanders and dragonflies, northern bobwhite quail are native to Long Island and play a vital role in controlling tick populations without harming other native species, according to Powers. Those in attendance included volunteers, students, teachers and Long Island comedian Joey Kola, who said that he “saw this program and jumped on right away” after personally experiencing Rocky Mountain spotted fever, a tick-borne illness transmitted to humans through a tick bite. Attendees initially gathered inside the park’s nature museum, where they learned about the quail, viewed preserved eggs and touched feather samples before listening to Powers’ talk. Powers described indoor-outdoor cats as the biggest threat to quail upon their release, and suggested people make use of what he referred to as “catios” — enclosed patios where cats can get outside without hunting native animals. However, because this is the first year the Caleb Smith quail cage has reached overcapacity — forcing a few hundred quail to be released earlier — Powers is optimistic the quail population may begin to take hold on its own if school and community participation continues to increase. Kids and adults alike were certainly enthusiastic about the release, as they gathered in the pouring rain to watch 500 birds abandon their cage and taste freedom for the first time. The quail were tentative at first, but as soon as one group took flight others ran through the crowd and into the woods. The remaining quail were released later on in the day. A few observers got a truly interactive experience when frantic quail landed on their umbrellas and even perched on their arms. And after the initial release, teachers and students took boxes of quail to various locations around the park and carried out their own private releases. Only time will tell how many of the birds will survive in the wild, but with increased community awareness that quail have the potential to lower the population of disease-ridden ticks, and a better understanding of the dangers posed to quail by cats, it seems likely that the birds most recently released will have a better chance of survival than those released in the past.